In 1996, the Board of Governors of the Federal Reserve System permitted bank holding companies (BHCs) to use Trust Preferred Securities (TruPS) as Tier 1 core capital. This move was cheered for making it easier for banks to raise capital. Since then, however, the reputation of TruPS has gone from financially good to bad to ugly. A recent legal case, FMB Bancshares, Inc. v. Trapeza CDO XII, LTD., has created concerns for community banks that use TruPS as part of their Tier 1 capital. While the ruling in the case denied some TruPS investors the ability to sue and recoup their investment, it also exposed TruPS problems that may threaten community banks in a way not imagined when TruPS were introduced. Many banks are left wondering what the future holds for TruPS. TruPS are a type of hybrid security that has features of both debt and equity. 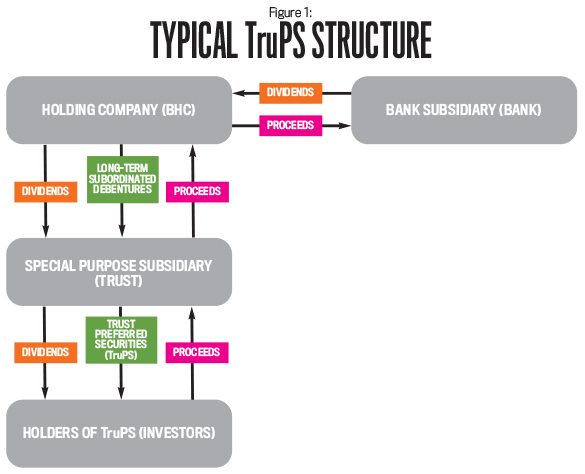 In a typical trust-preferred structure (see Figure 1), a parent BHC creates a trust subsidiary that issues TruPS, which are then sold to investors. The trust uses the proceeds from the sale to purchase long-term debentures (debt instruments that aren’t secured by physical assets or collateral) from the parent BHC. The terms of the debentures must mirror the terms of the TruPS and involve a subordinated liability structure. In other words, the debentures must be last in line to be paid compared to all other BHC debt—though the debentures do outrank equity in the payment pecking order. The proceeds the BHC receives from the sale of the debentures are then transferred to its operating bank to maintain the required minimum level of Tier 1 capital. After the trust subsidiary issues the TruPS, dividend payments go out to investors on a quarterly basis. The dividend transfer goes from the bank to the BHC to the trust to investors. The dividend payments to the BHC are tax deductible, which is what makes TruPS attractive. The fact that BHCs are allowed to treat the dividend payments as if they were debt payments makes TruPS an appealing funding instrument because debt has a lower funding cost than equity. A less attractive feature for TruPS holders is that the BHCs may defer paying dividends under TruPS for up to five consecutive years without triggering a default. Initially, major financial institutions were the issuers and purchasers of TruPS on the corporate debt market. Community banks were left out of the action because their comparatively small investment offerings couldn’t attract large institutional investors. Moreover, economies of scale made it less costly for large institutional investors to place TruPS on the market than for community banks. Things changed in 2000, when a group of investors proposed pooling TruPS into collateralized debt obligations (CDOs) with a subordinated liability structure. TruPS were “sliced” into “tranches” of equity and fixed-income securities, with the latter being assigned ratings ranging from BB (higher risk) to AAA (least risk). 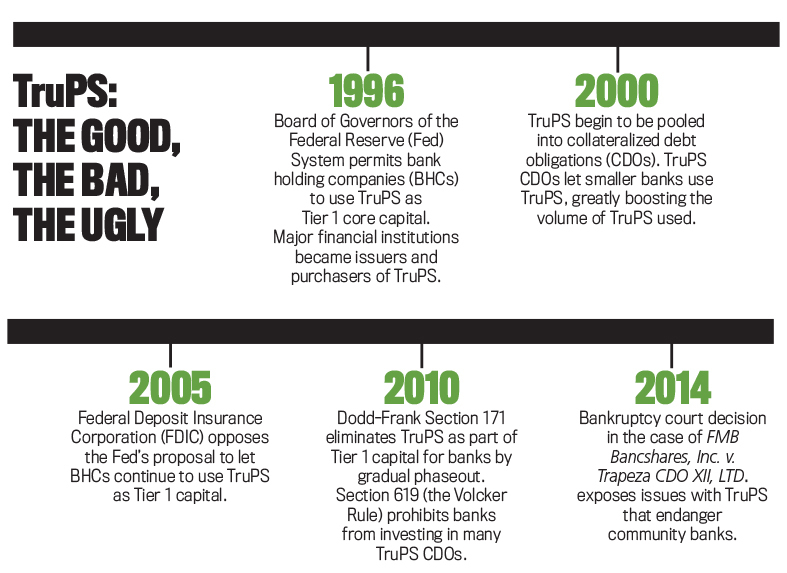 Introducing TruPS CDOs became a real “game changer” that drastically increased the volume of TruPS issued because smaller banks could actively participate in the corporate securities market. Unfortunately, regulators weren’t watching closely when smaller banks issued more and more TruPS to build capital. Financial institutions often mixed TruPS with other debt instruments, such as mortgage-backed CDOs, which made the developing real estate bubble and its tragic aftermath even worse. In the wake of that financial crisis, Congress introduced the Dodd-Frank Wall Street Reform and Consumer Protection Act (Dodd-Frank). 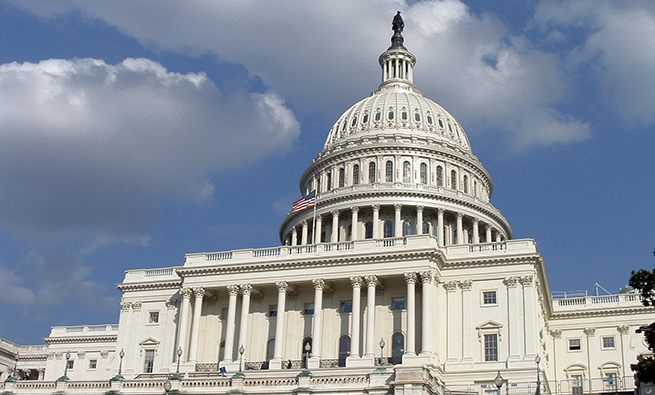 Section 171 of the Act, often called the Collins Amendment, eliminated TruPS issued after May 19, 2010, as an element of Tier 1 capital for all financial institutions in a gradual phaseout. 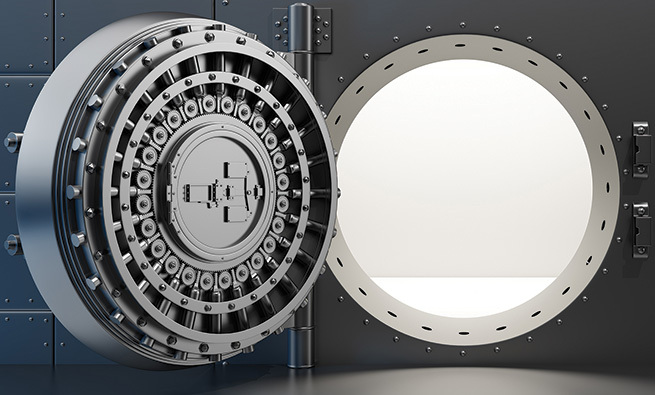 Section 619, known as the Volcker Rule, prohibited banks from maintaining investments in covered funds—including many TruPS CDOs. At first, the Volcker Rule made banks divest their positions in TruPS CDOs by July 2015. But in response to banking industry pressure, federal financial agencies issued an interim final rule on January 14, 2014, that let banks retain interest in certain TruPS CDOs if they met specific stipulations (see www.bit.ly/2bfJ07B). The impending fate of TruPS may have been signaled in 2005 when the Fed amended its risk-based capital standards for BHCs and the Federal Deposit Insurance Corporation (FDIC) opposed the Fed’s proposal to continue allowing BHCs to use TruPS as Tier 1 capital. The FDIC was concerned about the inability of banks to defer dividend payments indefinitely and the stress placed on subsidiary banks to service these dividends—suggesting that TruPS have more features of debt than equity. Now a Middle District of Georgia bankruptcy court has brought attention to the potential questionable investor security features of TruPS in the case of FMB Bancshares, Inc. v. Trapeza CDO XII, LTD. Farmers and Merchants Bank, a full-service community bank headquartered in Lakeland, Ga., is a wholly-owned subsidiary of FMB Holdco, a BHC. FMB Holdco created FMB Trust to obtain capital using TruPS. FMB Trust then issued TruPS totaling $12 million. Trapeza, a company incorporated under Cayman Islands law, consolidated the interests of all the FMB TruPS issued and thus was the sole litigant. In 2008, Farmers and Merchants Bank’s profitability took a dramatic dive. Forced into a rehabilitation program, the bank was required to maintain minimum capital resources and was prohibited from making any distributions on subordinated debentures (i.e., those lowest in the payment pecking order) or TruPS without the prior written approval of the Federal Reserve Bank of Atlanta and the banking commissioner of the state of Georgia. In January 2014, FMB Holdco asked to waive the impending dividend deferral period and instead start a new five-year deferral period so it wouldn’t have to pay dividends for another five years. Trapeza ignored the request, and FMB Holdco defaulted. Consequently, Trapeza called the note, including principal and interest due. As a result of these events, Trapeza filed a petition for involuntary bankruptcy for the bank under Chapter 7. In response, Farmers and Merchants Bank filed a motion to dismiss, claiming that Trapeza lacked standing to file an involuntary bankruptcy proceeding; that Trapeza wasn’t a proper creditor under Title 11 USC§303(b); and that the bankruptcy court didn’t have jurisdiction because it would excessively interfere with the bank and its regulators. It also claimed that bankruptcy wasn’t in the best interest of the bank or Trapeza and that the case was a two-party dispute more appropriately resolved in a court with general jurisdiction. The Court rejected these claims. Citing the indenture and amended trust agreement between the parties, the Court reasoned that the indenture allowed Trapeza to take judicial action to protect and enforce any rights. The Court also noted that, under the indenture, the trustee may bring a judicial proceeding to appoint a liquidator, custodian, or similar official. Therefore, Trapeza did have the standing to file its involuntary bankruptcy petition. * FMB Holdco’s request to suspend the bankruptcy proceedings under the legal “doctrine of abstention” was denied because FMB Holdco didn’t satisfy that doctrine’s requirements. This decision is a warning for BHCs that bankruptcy provides TruPs investors with strong means to leverage their rights. Notably, the Court rejected the bank’s claim that the debt to Trapeza is “contingent” due to the prohibition in the Federal Reserve Agreement that disallowed payments on the TruPs debt. The Court’s concern wasn’t if there was a present ability to pay but, rather, whether there was a legal duty to pay. Banks are now forced to weigh the cost of bankruptcy litigation and potential collateral damage against working out realistic solutions with the holders of TruPs in order to forestall involuntary bankruptcy. Moreover, banks should reevaluate the interest deferral periods—typically five years—in order to have a longer period to evaluate their Tier 1 capitalization structure and possible reorganization plans. Now that events have exposed serious flaws in the use of TruPS, will they survive? The future of the TruPS market may hinge on three factors: the Volcker Rule, financial markets, and legal precedent. The Volcker Rule reduced risk by getting federal agencies to give banks additional guidelines on using TruPS. On March 4, 2016, Volcker Rule agencies—including the FDIC, the Office of the Comptroller of the Currency, the Board of Governors of the Fed, the Securities & Exchange Commission (SEC), and the Commodity Futures Trading Commission (CFTC)—clarified the capital treatment of certain CDOs backed by TruPS CDOs. Specifically, the January 2014 interim final rule provided an exemption letting a bank retain an interest in or sponsor a covered fund that issues TruPS CDOs if certain requirements were met: The issuer must have been established before May 19, 2010, and the bank must have acquired its interest on or before December 10, 2013. The rule also clarified that any interests in qualifying TruPS CDOs would be deducted from Tier 1 capital when the bank acts as a market maker for the interests of such TruPS CDOs and investments in TruPS CDOs that are covered funds but don’t otherwise qualify as TruPS CDOs. In other words, if an entity is a market maker for a TruPS CDO, it can’t claim that CDO as Tier 1 capital. While the reputation of TruPS may be damaged, the rule granted latitude for smaller institutions, specifically those with less than $15 billion in total assets. Small banks have difficulty raising low-cost capital without a securitization pool. The rule allowed sufficient latitude for markets to meet these needs within the current regulatory guidelines. Markets adjusted quickly based on regulatory guidance. 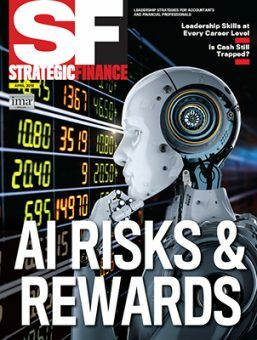 In fact, an article by Neil Mehta, “Keep on TruPin,” in the May 6, 2016, issue of Structured Finance Research, reports that the CDO market is rejuvenating after the stagnation caused by Dodd-Frank. There’s been a “marked improvement in underlying collateral performance and an uptick in primary issuance,” according to Mehta, who cited tightening spreads between the upper and lower tranches, upgraded ­ratings from both Moody’s and Fitch, and new issuances (see http://bit.ly/2bFVAec). For example, StoneCastle Financial Corp. pooled long-term subordinate debt issues from 35 community and regional bank holding companies in late 2015. These loans count as Tier 2 capital for the banks. StoneCastle then sold these as CDOs to four large institutional investors; the difference now is that the buyers didn’t include any banks. Instead, the holding company may use the proceeds to purchase stock in its underlying bank, thus again allowing the depository to treat the new capital as Tier 1 equity. In the financial crisis that came after the real-estate bubble burst, investors discovered that TruPS CDOs weren’t just risky investments—they also led to substantial losses. Yet there was uncertainty surrounding TruPS-related litigation and no legal precedent for dealing with TruPS. Investors seemed to have no leverage to force BHCs that sold TruPS CDOs into involuntary bankruptcy so they could recover the money they invested. The Court’s ruling in FMB Bancshares, Inc. v. Trapeza CDO XII, LTD. left many investors without a sound legal remedy or an opportunity to recoup their full investment. This could deter future investors from the TruPS market, but it’s hard to gauge the overall impact. The two parties reached a confidential, out-of-court settlement that resulted in avoiding bankruptcy for FMB Holdco, the bank’s BHC. These events may be bad news for many other investors experiencing similar problems with TruPS issuers. Although we don’t know the details of the settlement between Trapeza and FMB Bancshares, it’s very likely that investors had no choice but to accept the terms offered by the distressed bank and to salvage a portion of their investment. While Trapeza settled its claim, the issue of standing—the ability of investors to sue BHCs that sell TruPS—remains unresolved. The bankruptcy court is of limited jurisdiction, and its decisions are only of persuasive authority rather than legally binding. 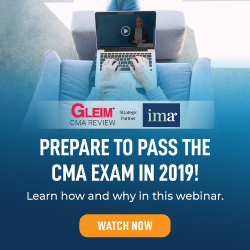 That means the matter can be re-­litigated, and other community banks may be placed in involuntary bankruptcy proceedings. In determining standing, however, future courts must consider the factors enumerated by the bankruptcy court. The first factor is whether or not another forum for hearing the case is available. In other words, is there another court available that should hear a dispute involving two parties? Remember that the Court ruled against FMB Holdco’s request to suspend the bankruptcy of investor Trapeza under the legal “doctrine of abstention” because FMB Holdco didn’t satisfy that doctrine’s requirements. One of those requirements is that another forum is available for hearing the case or a related action is pending. But the Court’s decision didn’t rule out the possibility that FMB Holdco might legally have an opportunity to suspend Trapeza’s bankruptcy or have it dismissed if another forum is available. This could happen. A rehearing in mid-November 2015 suggested that a court must determine whether only registered holders of TruPS can sue the BHC. Also unresolved are the risks to banks and their shareholders. While the bankruptcy hearing was going on, depositors fled the financially distressed Farmers and Merchants Bank. By withdrawing their deposits, they created a substantial liquidity risk—the risk that the bank no longer had the cash to meet its short-term debt obligations. Bank shareholders also saw the value of their stock continue to erode. Most important, if the bankruptcy court’s decision has value as a precedent, community banks may find it difficult to maintain Tier 1 capital requirements, which could lead to actions against them from the FDIC and debtholders. Roy W. Copeland, LL.M., J.D., is assistant professor of management at Valdosta State University. He also is a member of the State Bar of Georgia. You can reach him at rcopeland@valdosta.edu. Karin Roland, Ph.D., is the professor of finance and interim department head at Valdosta State University. You can reach her at kroland@valdosta.edu. Dmytri Kuliy is a graduate business student at Valdosta State University. You can reach him at dkuliy@valdosta.edu.